Elephant is pleased to present Liquid Nails, a collaborative exhibition by Martha Mysko and Emily Nachison. Liquid Nails will be on view from July 13 through July 29, with an opening reception July 13, 6-9 PM. Gallery hours Saturdays and Sundays 12-4 PM, and by appointment. 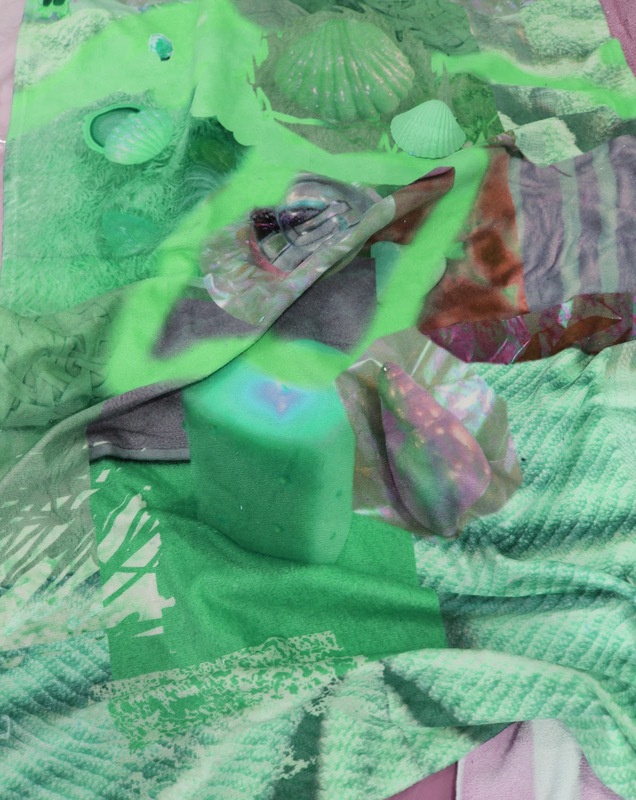 Seashells, candles, hair gel, oversized perfume bottles, custom-printed beach towels, fountains, and teenage paraphernalia are collaged together to create a liminal environment inspired by dreamscapes, cheap beauty products, cartoon color palettes, google image searches, and low-budget film sets. The resulting work creates both tension and fluidity between tactility, desire, toxicity, beauty, illusion, mystery, revulsion, and disappointment. With a heart-shaped tub at its center, the exhibition gives form to an ongoing exchange of dialogue and imagery between the two artists, melding their seemingly divergent processes and practices into a cohesive exhibition and critical investigation into consumption and reverie. Martha Mysko builds fractured narratives using both abstract and representational languages. Creating temporary, color-saturated installations, she works fluidly between the physical and the digital. She finds potential in second-hand items and in kitsch--avoiding nostalgia and questioning conceptions of taste and value. Cultural and personal associations tied to objects and materials are disrupted through formal play, and her explorations of painterly space. Martha lives and works in Pontiac, MI in Metro Detroit. Emily Nachison creates mixed-media sculpture that pulls from the disparate, yet conjoined, histories of science and mysticism. Predominantly comprised of cast glass and natural materials such as leather and hair, the sculptures and installations reference the practice of mythologization as a means of explaining natural phenomena and wish-fulfillment. Recent work uses this as a starting point to explore adolescent fantasy and false promises. Emily lives and works in Joshua Tree, California and Portland, Oregon.